The results of Food Processing's annual manufacturing survey – including the strategies companies intend to pursue to ensure safety, how the Food Safety Modernization Act continues to inspire changes and improvements in supply chain traceability – all are reported in this E-Handbook. Food safety is the top concern of everyone in the food and beverage processing industry. We can say that with statistical certainty, as it came in as the top concern for 2019 in Food Processing’s 18th annual Manufacturing Survey. 27 percent of respondents ranked it as their top priority, and its collective, weighted ranking was 7.2 on a scale of 10. Worker safety was next, garnering 17 percent of first-place votes and a score of 6.0. 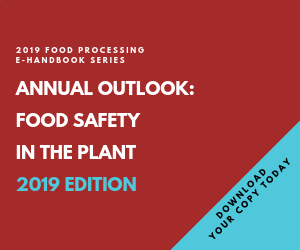 Not only will this E-Handbook provide you with extended results of Food Processing's annual manufacturing survey, but it also includes white papers and essays from our (and your) partners in food safety. Mettler Toledo writes about the importance of inline inspection equipment. Pick Heater tells how direct steam injection can provide instant hot water for sanitation. Rice Lake covers "The 10 Principles of Sanitary Design." Rosedale Products talks about the role of liquid filtration systems.